Valentine’s Day is four short days away. If you’re like me, you wait until the last minute to purchase the perfect gift. So, I’m doing a “Countdown to V-day” series of daily blogs to give you gift ideas. 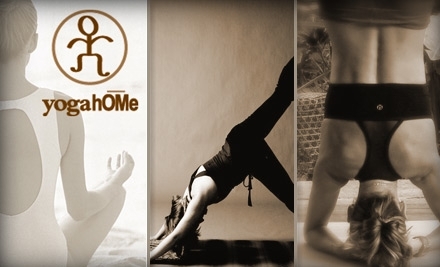 Today’s feature is on yogahOMe yoga studios, where you earn a free class to use at any yogahOMe studio any time you bring a friend to class with you! This is good all Valentine’s Week! They have a few different locations too, which is nice: Oakley, Mariemont, Bellevue, and Symmes. Click here to learn all the deets about the special. I found out about this special by asking on our Cincy Chic facebook page if any local businesses were having V-day specials and someone from yogahOMe responded. It’s funny because Julie over at Wine Me Dine Me and I were just talking about yogahOMe. She goes there and loves it! My husband and I recently re-upped our YMCA gym membership and have been going together a lot lately. Even though it sounds like the least romantic thing you could ever do with your special someone, it’s actually a great bonding/flirting experience. He’ll be lifting weights and flex his muscles at me. I’ll be running on the treadmill and give him a wink as he walks by. Then you’re all hyped up on endorphins after the work-out, which gives you lots of energy for other “more romantic” activities! : ) haha! Check out the great “About Us” video below that yogahOMe just posted to their site! I think it does a good job of giving you a sneak peek into their studios, clients and instructors.